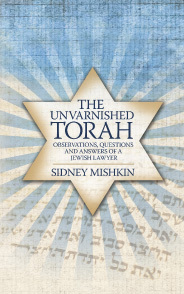 Sidney Mishkin is a practicing Jew who loves and respects the Torah. He analyzes the Torah’s texts with unique observations, questions that should be asked and well-considered answers that give the Tradition a vote but not a veto. For example, Mishkin writes why he thinks the Akeda was also Abraham’s test of God. He asks why God told Moses at the Burning Bush to misrepresent to Pharaoh God’s plan to free the Israelites form Egypt. He also makes the case that the Israelites were forced laborers in Egypt, not slaves. He demonstrates that the Exodus from Egypt was leisurely and not rushed according to some of the versus of the Torah. He also offers some interesting thoughts on the prohibition against boiling a kid in its mother’s milk. Every chapter of this book is worth reading. Mishkin marshals and analyzes the evidence on important questions, which is what good lawyers do. He identifies what he believes are justices and injustices in the Torah. He writes about Righteous Gentiles and deserving and undeserving heroes and pariahs in the Torah. This is an important book that enables all to read the unvarnished Torah and to re-examine their understanding of the Torah, while maintaining their reverence for the Torah and for Judaism.